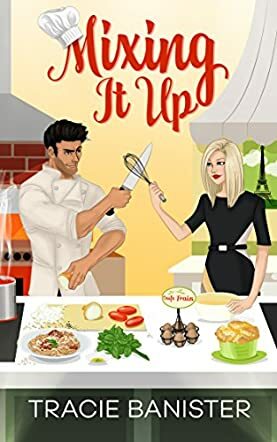 Mixing It Up by Tracie Banister is a hilarious tale of one woman’s bid to lead her life as she sees fit. Cecily was born to a well-to-do family, but has disappointed them with her choice of career. She has her own TV show, Serving Romance, where she demonstrates French cuisine and she thought it was successful. Until the network is taken over and shaken up by Devlin Hayes. He wants to change the show and bring it into the present, but his plans don’t sit well with Cecily. She tries hard to get along with her new co-host, Italian chef Dante Marchetti, but they have history and it isn’t a good one. Cecily must fight to keep the integrity of her show intact and finds herself stooping as low as her new boss and her co-host to get what she wants. But is this really where Cecily belongs? Wouldn’t she be better off doing what she loved best elsewhere? And is her boss really “all that” or is it just part of his ploy? Mixing It Up by Tracie Banister was a fantastic story and is a must-read! It is a funny, sassy, and energetic story with plenty of go in it – I can assure you there are no dead bits here! Ms. Banister has written some incredibly clever, likeable, and interesting characters here and I absolutely loved them all. Each one brought something new to the story, another dimension that just added to the depth and direction the plot was going in. Each character is well developed, especially the main protagonist, Cecily, a woman that I couldn’t help but like. I found myself rooting for her so many times, indignant on her behalf so many times, and cheering for her as well. This isn’t a straightforward tale and you will certainly be taken on a roundabout way to the explosive finale. I absolutely loved this book, it is an addictive read and I will be looking for more books by this wonderful author.